Note: This review of Solo: A Star Wars Story does not contain any plot points, reveals or character spoilers. However, the tone, climate, and a discussion of the story’s impact will be discussed at length. If you wish to remain 100% spoiler-free, consider coming back and reading this review after you have seen the film. The second standalone film in the Star Wars mythology, Solo: A Star Wars Story brings with it a unique set of expectations. This is the film that promises to provide backstory on Han Solo, the rogue smuggler turned reluctant hero of the Rebellion. The weight of this film is unique in Star Wars lore, as it is not dependent upon the Skywalker lineage that has enraptured us for over forty years. Instead, it brings with it the daunting task of daring to expand upon the legacy of the captain of the Millennium Falcon. Juxtapose that with inserting a new actor into the lead role of Han Solo, and you have a potential cauldron rivaling a deactivated hyperdrive aboard the Millennium Falcon. If you are among the many that believe Han Solo’s first appearance on Tatooine in the Mos Eisley Cantina is borderline sacrosanct, you might be wondering, do we need a Han Solo origin story? And, can anyone take the role with the panache of Ford? The answer is yes, in many ways. In the titular role of Solo, Ehrenreich is a mix of charisma, charm, arrogance, and personality. He does not do an impression of Harrison Ford, but rather showcases the spirit and wily magnetism of the character that we know and love. 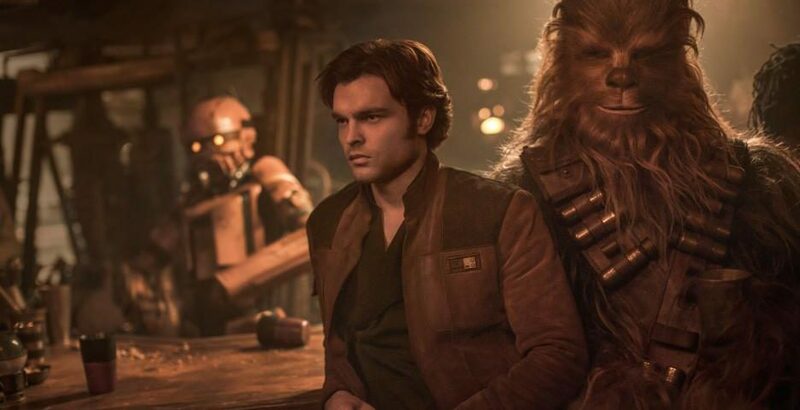 Ehrenreich brings a refreshing and satisfying portrayal of Solo that the trailers did not deliver on, but is present every time he is on screen. Alden Ehrenreich does the impossible: he made me forget about Harrison Ford’s interpretation of the character, and that is no small feat. Alden Ehrenreich is a worthy and deserving captain of the Millennium Falcon. The rest of the cast is equally satisfying. Joonas Suotamo is back for the third time as Chewbacca and is a perfect co-pilot for Alden. In many ways, this is more of a Chewbacca showcase than any cinematic appearance of the character in the history of Star Wars. In Solo, Chewie isn’t a loveable sidekick, but a major character with his own arc. Chewie and Han have always been a great tandem, but being given a window into what makes their relationship tick is what drives this film. While Ehrenreich’s performance may be something of a pleasant surprise for those who had reservations, Donald Glover’s will not catch anyone off guard. As Lando Calrissian, he brings it, and then some. He is as cool as the other side of the pillow but also brings an edginess sometimes belied by his magnetic personae. We get the smooth-talking scoundrel vibe, but also glean that he’s not someone to be taken for granted. There’s a bit more depth there, and I hope audiences will get to see that played out in future big-screen offerings, should Glover’s Lando return. Woody Harrelson (“Beckett”), Phoebe Waller-Bridge (“L3-37), Emilia Clarke (“Q’ira”), Thandie Newton (Val), Paul Bettany (Dryden Vos), and Jon Favreau (“Rio Durant”) round out the cast, and each brings their A-game to the sabacc table. I will refrain from spoilers but will say that Clarke’s “Q’ira” practically steals the movie. Bettany is “deliciously evil” (as he told us during the Solo press conference), and Harrelson’s Beckett is the perfect mentor for Han Solo. Much of the buzz will undoubtedly be on Waller-Bridge’s feisty droid, and she certainly delivers a tour-de-force performance. However, L3’s contempt for the role of droids in the galaxy is more didactic than it is metaphorical and may be a bit abrasive in some instances. As far as the story itself, while Solo is a rousing adventure, full of action, surprises, and more than a few laughs, it is certainly different from any other Star Wars film. That, in and of itself, is a good thing. I don’t need anything pre-packaged. However, the level of cost in this film is very low. This is the first film in the franchise that does not have galaxy-wide implications, which again, is not a pejorative. However, the scope seems a bit narrow for a big screen Star Wars movie. Again, this is not a bad thing, and I was blissfully entertained. Lawrence and Jonathan Kasdan are the ultimate muses for Ehrenreich’s Solo, and Ron Howard has delivered a beautiful film that is 100% oxygenated in Star Wars. However, this is much more of a snapshot into a specific moment in the mythology than it is an integral chapter in the overall franchise. My hope is that there is more of Ehrenreich’s Solo yet to be told, which may render this point moot. Either way, Solo: A Star Wars Story gives us an entertaining, exciting, visual spectacle that is ripe with stellar performances, eye-popping moments, and plenty of Han Solo/Chewbacca/Lando Calrissian that will have you yearning for more. This is an excellent review that greatly encapsulates the positive aspects of Solo: A Star Wars Story. Plus, I really like your blog name and logo. This is an excellent review that greatly encapsulates the problematic aspects of Solo: A Star Wars Story.